Over the year, doing this blogging project, I have tried a wide variety of ethnic food. Prior to this project I was the biggest picky eater and refused to try anything new. However by choosing to do ethnic foods for my blog project I forced myself to step outside my comfort zone. And though I can’t say that I am 100% adventurous in the area of food and will eat anything now, I will say I have improved. I no longer worry as much about going to a restaurant and not liking anything on the menu. Also, I’ve found myself eating a lot of the food that I tried for this project in my everyday life. There was definitely some food I didn’t like but I found that by trying other things you will find things that you do like. My blog focused on restaurants downtown or around state college that offered a wide variety of ethnic food, but there is also on campus food places that offer delicious ethnic foods. In Findlay in east, there’s the Asian Grille which features made to order stir fry and General Tso’s chicken. Also in the commons they serve up Sol de Cobre mexican food. Most of the dining halls on campus feature Italian food to some degree in their pastas. South offers a wide variety of food including Japanese sushi, Mexican food and classic American staples. West has a wide variety of vegetarian options. North offers Italian food at rigaTony’s and Middle Eastern food at Halal. 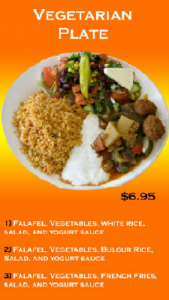 The Hub offers some different ethnic food, though commercialized versions. The wide variety of ethnic and diverse dishes that the food staff offers at Penn State allows students to try new things without breaking the bank. Though this food may not be the same quality as the restaurants downtown, it still is pretty good. Overall this project has taught me many things. 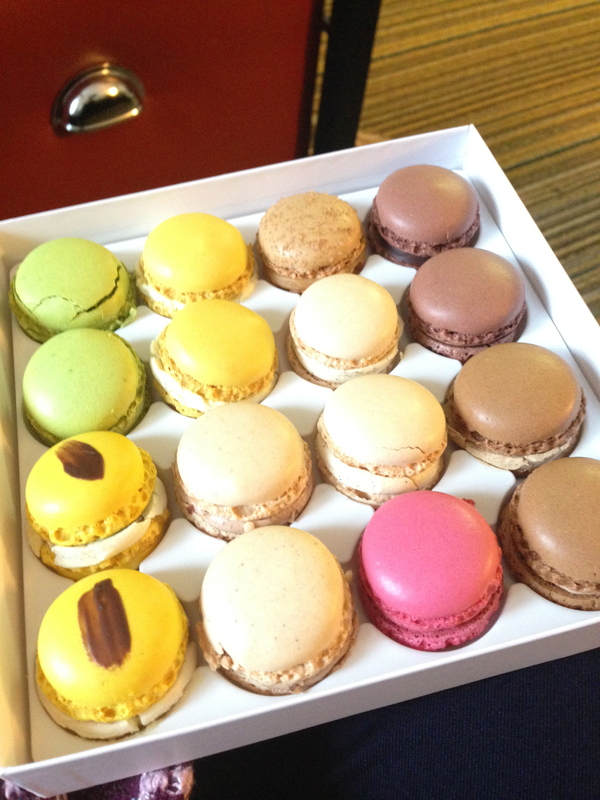 Its made me more likely to try new things, not just food, and also to not judge things by the way they look. A lot of the food I wouldn’t eat before because I thought it looked “gross” but after eating it I found it quite good. Hence open yourself up to trying new things and don’t judge a book by its cover. Over spring break, right before St. Patrick’s Day, my family got a variety of food that was typical for St. Patrick’s day. This included Irish potatoes andIrish soda bread. I don’t really enjoy this food but it’s a nice tradition for each year to get this food and it reminds meof the memories we have around this time of year. The biggest influence on Irish cuisine is its temperate and climate. When the potato crop was introduced in the 16th century, the cuisine of Ireland changed. Now the traditional dishes include Irish stew, bacon and cabbage, and boxy (potato pancake). Another typical dish is coddle which is usually made of left overs so its no specific recipe but usually has pork sausages, bacon, potatoes, and onions. Colcannon consists of mashed potatoes, cabbage and kale and is another staple of irish food. The most common ingredients used in Irish cooking are fresh vegetables, shellfish, a wide range of cheeses created across the country and the potato. Fish and chips, though thought of as British, are also very popular. In recent times, there has been an influx of foreign food including fast food. Ireland is highly regarded for their alcohol production. This includes beer, whiskey, irish coffee and lager. The beer produced in Ireland is typically Porter and Stout, most popular being Guiness. The whiskey created in Ireland is most particularly single pot whiskey, like Jamison. 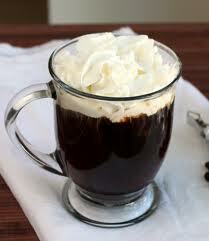 Irish coffee is made of black coffee, whiskey, and cream, usually Bailey’s irish cream. And the last popular alcoholic beverage is lager which is a type of beer usually fermented and conditioned at low temperatures. St. Patrick’s day is the holiday most associated with Ireland and has some unique food linked to it. 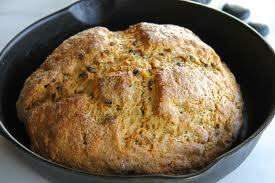 As stated before, irish potatoes and soda bread are foods associated with Ireland here in the United States. There’s the traditional dish of corned beef and cabbage that is eaten for St. Patrick’s Day. 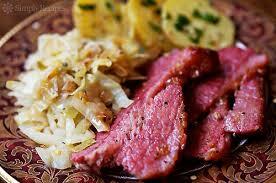 Originally the dish was cabbage and Irish bacon but in the early part of the 20th century Irish immigrants changed to corned beef as a cheaper alternative. I had a really busy week this week so I didn’t actually get to try this food but I still found a restaurant that serves up unique food. Penang is located on Atherton street but they conveniently deliver. There is also a wider variety of items on the menu and they are at a good deal! 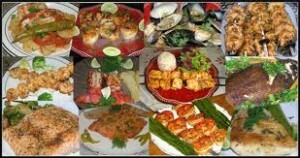 Malaysian cuisine is a combination of Malays, Chinese, Indian, Indonesian with some European influence. Soy sauce is essential to many Malaysian dishes and comes in many different varieties. Another essential food to Malaysian cuisine is belacan. 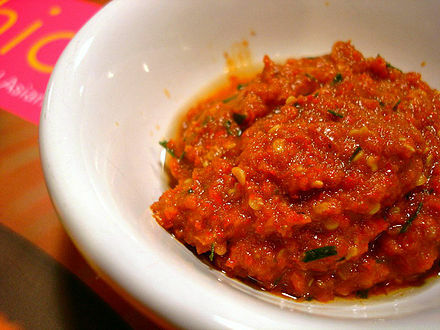 It is a type of shrimp paste which is then pressed into a block and sun-fried. Lemongrass, tofu and palm sugar (called gula melaka and made from coconut palms). Similar to other Asian cuisines, rice is a staple food in Malaysian cuisine. 70% of the rice eaten in Malaysia is made there and the rest is imported. Typically white rice is served as a side dish to the meat entree. The national dish of Malaysia is nasi lemak. This is rice steamed with coconut milk and pandan leaves giving it a rich fragrance. It is then topped with a variety of foods from peanuts to eggs giving it distinct flavors. 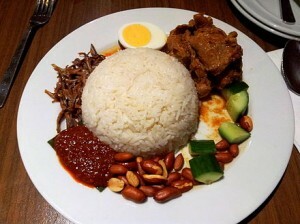 Originally nasi lemak was a breakfast food but has been adjusted to be able to be served at different meals. Another popular Malaysian dish is congee (a type of rice porridge). It is primarily eaten as a breakfast food or supper and is so popular it is a constant staple on the Malaysian McDonald’s menu. 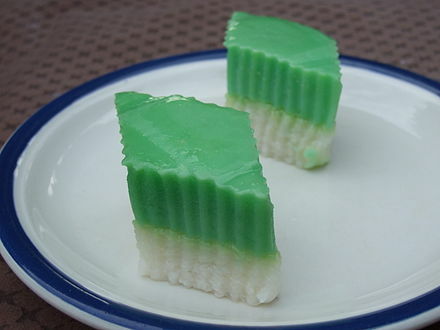 Kuih are bitesize foods produced in Malaysia which are typically cookies, cakes, confections, pastries and sweat meats. Kuih dishes are often steamed or fried and then baked and are rice based giving them a very distinct texture. The style of dining in restaurants is much different than the style here in America. Rice is viewed as the center piece and then there is a buffet style of dishes. This type of dining is referred to as nasi campur. Last semester my German class went to lunch at Herwig’s bistro downtown. The restaurant features traditional German and Austrian dishes. After 5 years of German, I know a lot about German culture and food, and Herwig’s definitely provides that. The menu can be a little intimidating to those who don’t understand the language, but there is a wide variety so there’s something for everyone. They also have an extensive dessert list (if you’re like me and have an extreme sweet tooth, you will definitely enjoy this). German cuisine is one with a rich history that has evolved over many social and cultural changes and also differs among the different regions. Meat is very important in German cooking. The most popular types of meat being pork, beef, chicken, turkey, goose and duck. Boar, rabbit and venison are also consumed. 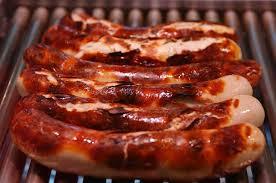 The meat is typically braised and the Germans have a history of sausage making, their wursts. Bratwurst, being the most popular, is made of pork and a variety of spices. A popular pasta dish in Germany is Spätzle which is made of wheat, flour and egg yolk. German food is normally not very spicy or hot and this is due to the spices used in their foods. The most popular being parsley, chives, juniper berries, and caraway. 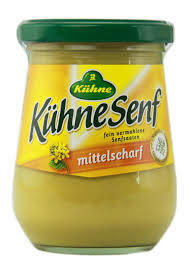 They do usually put mustard (senf) on their wursts and there is a wide variety of mustards throughout Germany. Horseradish is another popular condiment. During Christmas time, many German traditional foods emerge. The traditional dish for Christmas Eve dinner is the Weinachtsgans, or roast goose. 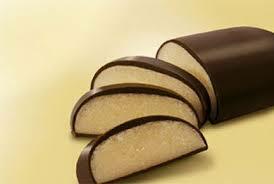 Another popular food around Christmas time is Marzipan. This is made of sugar or honey and almond meal. It is then shaped into different shapes including animals, and in Germany in the shape of bread or potatoes. The traditional German meal structure focused around a large lunch. First there would be breads, cold cuts, marmalade, eggs, and coffee for breakfast. After this people would go to work or school and then return home for the main meal of the day, lunch. Dinner would then consist of sandwiches or something light. However, over recent times the meal layout has changed into one similar to that in the United States where dinner is the main meal. 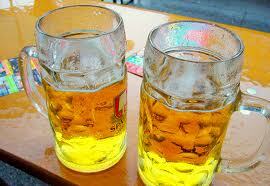 Germany is well known for its beer production with more than 4,000 brands of German beer. One reason German beer has such a distinct taste is due to the purity law. This requires all breweries to use certain materials (barley malt, water and hops) and which they cannot. There are over 300 different kinds of bread in Germany. 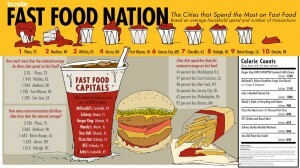 This week I decided to take a look at food that transcends across all cultures and nations, fast food. Though the quality of the food may be questionable, the prices are sure good. And what’s better than some fast food at 3 in the morning when nothing else is open? Well this was certainly the dilemma I faced over spring break. Unlike some people I did not travel to some exciting place but rather to my hometown where mostly everything closes by 11. Thus we were forced with the choice between the classic fast food establishments besides deciding on Wendy’s. 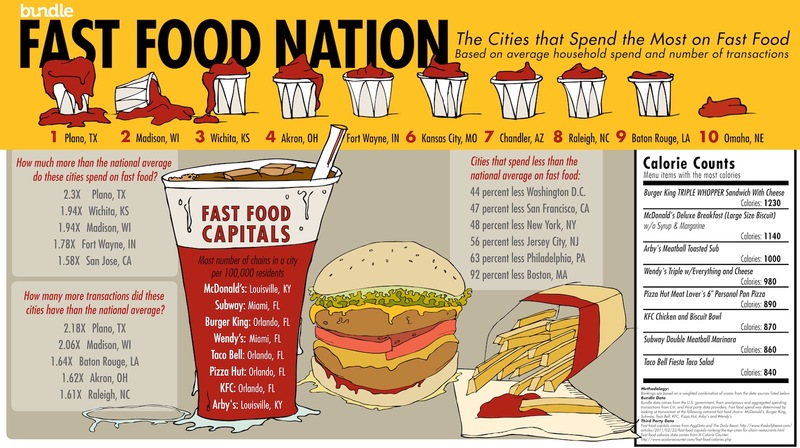 This got me thinking about fast food and its impact not just here in America but also across the world. Defined in Merriam Webster, fast food is of, relating to, or specializing in food that can be prepared and served quickly. 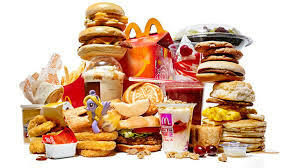 Commercialized fast food is often prepared at a central supply facility and then shipped out to the franchises were it is then reheated, cooked (usually fried) or assembled in a quick amount of time. Therefore many of the different foods include ingredients to ensure a certain flavor and also to remain fresh. 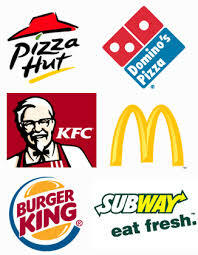 Around the world there is wide variety in what constitutes fast food. In the middle east, kebab houses are very popular. Here meat is shaven from a rotisserie and served on a flatbread with salad and choice of dressing. In the Netherlands the main fast food dish consists of french fries with a meat dish side and sauce on top. In Eastern Europe noodle shops are extremely popular. One thing I found interesting while doing research on this, was the variety that many American chains placed in their restaurants around the world. Many of these different items are instituted to reflect the native food and also unique cultural desires. The McDonald’s around the world usually contain their usual items such as the Big Mac and quarter pounder in addition to local originals. Here are some of the most interesting ones I found. In Hong Kong there’s a pork burger with Teriyaki sauce and cabbage. Also in Asia, a dish called Bubur Ayam is served which is literally chicken strips in porridge with onions, ginger, and chili pepper. In the Middle East, McDonalds serves up the Veg McPuff Pizza which is rectangular dough filled with tomato sauce and vegetables. Also in some countries in Europe they serve beer and wine. For this week I decided to order food from a Korean restaurant, Maki Yaki off Order Up. I got veggie sushi and egg rolls which was all good. The sushi was pretty large to eat in one bite and the food took over an hour to come so that was a little disappointing. However, the price and quality of the food made up for it. Korean food has evolved greatly over time due to cultural, social, political and environmental changes. Similar to other asian cuisines, Korean cuisine is comprised of mostly rice, vegetables and a variety of meat. 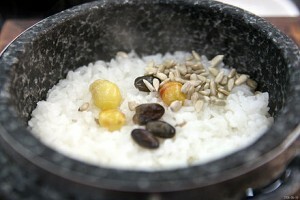 One of the most common things Koreans do is serve side dishes (banchans) to consist of steam cooked short grain rice. A popular side dish is kimichi which is made of vegetables and a variety of seasonings; it is often either described as sour or spicy. Other popularly used ingredients include sesame oil, doenjang (fermented bean paste), salt, garlic, ginger, soy sauce, pepper flakes, and gochujuang (fermented red chili paste). One of the most important foods in the Korean diet is grains, and there are even myths of how they acquired grain (that’s how important it is). When rice was first introduced to Korea it was extremely expensive, therefore the people mixed it with other grains to “stretch the rice”. 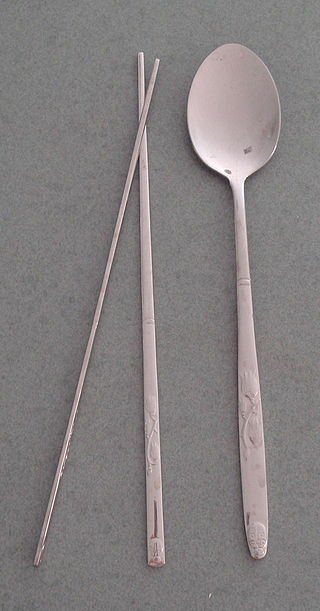 This is still used today in some dishes. Other dishes consist of rice cooked in a sot, the same method used for centuries. 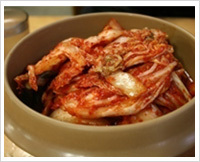 There are different important aspects of a Korean meal. 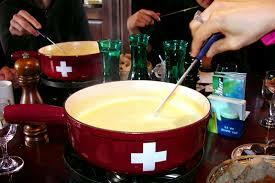 Soup is served with the meal as opposed to traditionally done here before the meal. 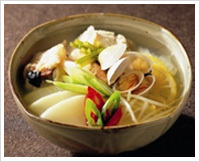 Guk is a type of soup often made with meats, shellfish, and vegetables. More formal soups that are served as the meal are usually referred to as tangs, and stews are known as jligae. There is also a big emphasis placed upon side dishes. Korean food has a very intensive etiquette that can be traced by to Confucius’s time. Many of the earlier rules (such as the men and women ate separate, eldest male ate first, to never eat so fast to look as though you’re taking someone else’s food or eat to slowly to seem as though you aren’t enjoying it) have been relaxed but there are still some etiquette rules in place. For example, the younger people of the table should not start eating until the elders have nor should they finish before them. Contrary to other Asian cultures, the rice bowl is not lifted from the table when eaten. This is due to the fact that along with chopsticks, people are given a spoon (called a sujeo) that is expected to be used for soup and rice. The setup of the table is also significant with hot foods set to the right of the table and cold foods to the left. When drinking alcohol, diners are supposed to face away from the eldest male and cover their mouth. There’s a place right on college avenue that serves up traditional Turkish food. This place is called Penn Kebab and it offers a wide variety of dishes that may overwhelm anyone. There are so many choices that look unfamiliar to at least me, I struggled with what to pick until I ultimately went with the vegetarian platter. Overall the food was rich in flavor and I enjoyed it, the only drawback of the place was that they didn’t accept lioncash (so I had to fund this one). 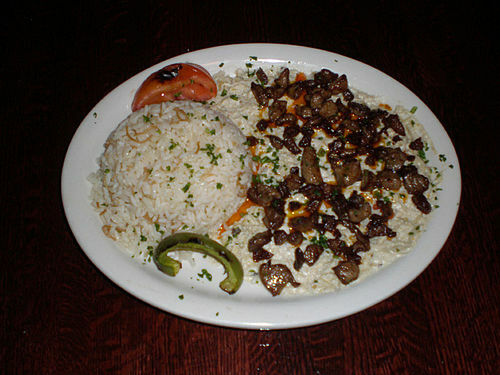 Turkish food is a unique cuisine is influenced by many different nations around it and also a lasting influence on other nations. The cuisine began with the Ottoman Empire which was comprised of Central Asian, Caucasian, Middle Eastern, Mediterranean, and Balkan cultures. This led to the different types of influences on Turkish food and also explains for difference in regional food. There are many foods that are staples of the Turkish diet. The meats most commonly consumed are chicken, beef, fish and lamb (was once shunned but is now widely consumed). Also fruit is very available is cheap throughout Turkey leading to great variety in the different types used. In traditional Ottoman cuisine fruit is served as a side dish to the meat dish. Typical fruits used are plums, apricots, pomegranates, pears, apples, grapes and figs. Nuts are also very important, especially pistachio, chestnuts, almonds, hazelnuts and walnuts. The nuts are essential to Turkish desserts but are also commonly eaten by themselves. Yogurt is another common ingredient (the english word for yogurt comes from the Turkish word yoğurt). There are many staple dishes of Turkish food. Perhaps the most popular is the kebab. Surprisingly Turkish kebabs are not only grilled or skewered meats but also include casseroles and stews. 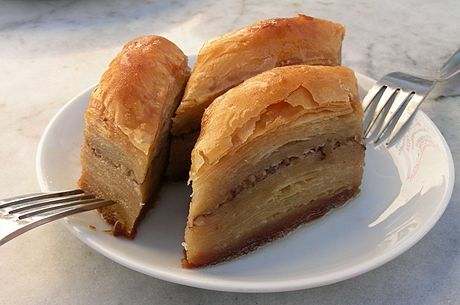 The most popular dessert item of Turkish food is baklava which is made with either pistachios or walnuts. There is also many different varieties of baklavas. A popular Mexican restaurant in State College is Rey Azteca which offers a wide variety of traditional Mexican food. I enjoyed the Pollo Loco (a chicken dish). It was overall pretty good and wasn’t too expensive. The restaurant also offered a wide variety of options. The only problem I had with it was the fact that it was not located conveniently downtown but rather a bus ride away by the Nittany Mall. Mexican cuisine is a mix of early middle American cooking styles and early European techniques (due to the colonization), especially Spain. With the colonization of Mexico, many new items were added to the traditional diet. These included the use of domesticated animals, dairy products and various spices. These new additions combined with the already traditional elements of Mexican food: corn, beans, and chili peppers; created the signature Mexican cuisine. Food is an essential part to Mexican culture. The ability to cook well is seen as a gift gained from much experience and training and also a dedication to cooking. For the festival, Day of the Dead, the traditional food of mole and tamales are set upon an altar for the dead to enjoy. If people eat it afterwards it is said to be “tasteless” for the dead have already eaten it. 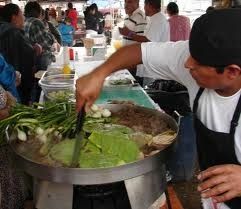 Another important aspect of festival cooking of the popular dishes (mole, barbacoa, carniotes, and mixiotes) is that they are prepared for large amounts of people thus many people must cook these dishes. This encourages the idea that cooking brings together families and communities. Street food is also an essential element to Mexican cuisine. 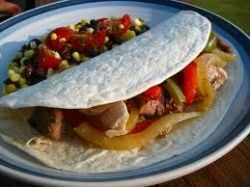 It represents the type of food that most of us assume is typical “Mexican food”. This includes tacos, quesadillas, and tamales. Mexican street food is popular for it fills people up without having the emotional connotation of eating at home. The taco is the most popular street food and is most often eaten as a snack in midday as opposed to as a meal. The fillings in the taco vary across the different regions of Mexico. 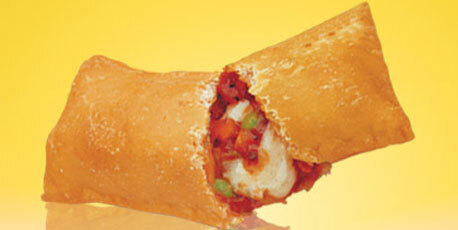 Another popular street food option is the torta, a roll of some type stuffed with ingredients. There are different foods to the different regions of Mexico. The northern area consists mostly of meat dishes and in the southern areas chicken and vegetables are especially popular. For my first post of the second semester I decided to order Chinese food. Conveniently enough I was able to order off orderup.com and ordered from China Dragon. I went with the chicken and broccoli dish, which was pretty good and they gave you a decent amount. My only complaint is that the food took almost an hour to get there so by the time it came I was starving (so I probably would have thought anything was good). Chinese food is a classic across the world, with many different restaurants. However traditional Chinese food is quite different from the type we get here. There are 8 Culinary Traditions of Chinese food that each specialize in different ingredients and cooking methods. The different types of traditions are Anhui, Cantonese, Fujian, Hunan,Jiangsu, Shandong, Szechuan, and Zhejiang. The Anhui tradition uses wild herbs and is also known for its simple preparation. Cantonese food is what most of us regard as “Chinese food” with much focus on meat. Much of these styles also coincide with different regions within China. For example, Zhejiang tradition comes from the region of the same name and highlights foods that have a fresh, soft flavor and a mellow fragrance. Though China has its regional differences, there are also staple items across all areas of the nation’s cuisine. Rice, a staple of Asia overall, is tradition in Chinese dishes. It is used in most dishes. Another staple of Chinese food is tofu or soybeans, which are used as an alternative to meat for protein. Noodles are also very prominent in dishes, either served in soups or fried as toppings. The Shou Mian variety of noodles is known to symbolize long life and good health. Drinks are also essential to Chinese cuisine. Tea and herbal tea are popular, for China was the earliest nation to drink tea. Similar to food, tea is different in many different regions. 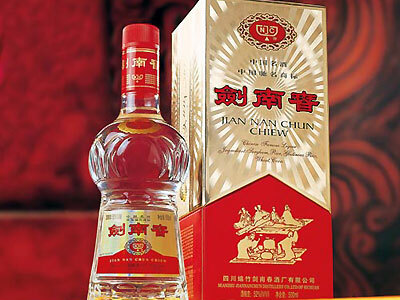 Another popular drink in China is baijiu, a white liquor. It makes up 99.5% of the liquor market in China, making it the most consumed alcohol in the world. Contrary to the United States, fortune cookies are hardly ever consumed.